Generic drugs have for several decades offered relief from rising prescription drug costs. This occurs because there is robust competition among multiple interchangeable products that drive prices for generic drugs to be a fraction of that of the corresponding brand name drug. The result is that decreases in generic drug prices have partially offset large increases in prices for brand drugs. Reports of spikes in the prices of some generic drugs have raised concerns that generic drugs are contributing to increases in overall prescription drug spending. This has led policy makers to ask whether markets for generic drugs are operating efficiently. 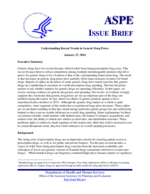 In this paper, we review existing evidence on generic drug prices and spending. Our review of evidence strongly supports the conclusion that generic drug prices are not an important part of the drug cost problem facing the nation. In fact, about two-thirds of generic products appear to have experienced price declines in 2014. Although the generic drug market as a whole is quite competitive, some segments of the market have experienced large price increases. These spikes are on one hand troubling in that they disadvantage particular patient groups but also sufficiently limited so they exert no sizable influence on overall drug spending. Some explanations for these occurrences include: small markets with limited entry; the impact of mergers, acquisitions, and market exits; the ability to obtain new market exclusivities; and distribution activities. These problems apply to relatively small segments of the market and, while they lead to increased costs in certain therapeutic areas, they have little influence on overall spending increases.